You’ve finally installed those perfect countertops and your kitchen looks glorious. As you are cleaning up after cooking a meal, you notice there is a stain on your pristine stone. Oh no! What is there to do? Never fear. Your life isn’t over if your countertop stains. There are some effective stain-removing tricks, as well as prevention methods to reduce the risk of major staining. 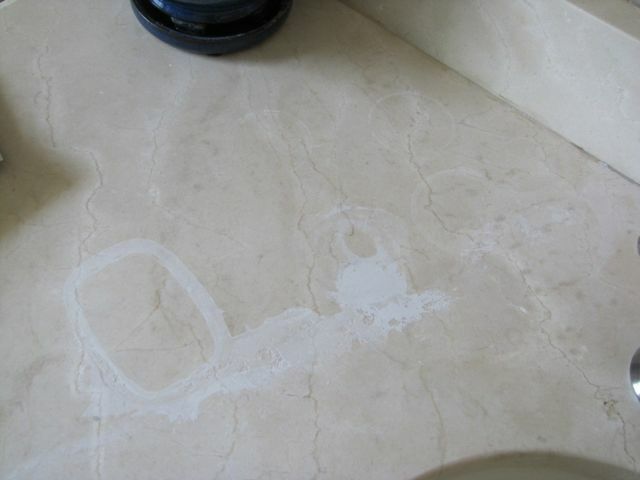 And, if worse comes to worse, stains often add to the character and charm of your countertops. First things first: prevention. Several types of natural stone counters don’t react well to highly acidic foods. When using these, always cut and use them on a cutting board, and clean up any spills quickly. You can also use trivets to protect your stone surfaces. At the same time, you don’t want to have to tiptoe around your kitchen. So when a spill or stain inevitably does happen, there are some ways to reduce the appearance of the stain or to remove it completely. One option is to use a commercial or DIY stone poultice on the stain. This can be a mixture of baking soda and hydrogen peroxide that forms a thick paste the consistency of peanut butter. It is then wiped over the stone, covered with plastic wrap, and left on for 24 hours before being wiped away (you’ll need to reseal this spot to prevent further staining!). The methods that you use to protect and clean your countertops depends on what they are made of. You can always ask a professional what kind of care your stone needs to ensure that it lives its best life. Many stains fade with time and use, so, if anything, any stains will become a part of their character and charm.